Native to china japan australia. A most un-figlike habit, it is one of the few plants which attaches itself securely to wood masonry or even metal in barnacle fashion. 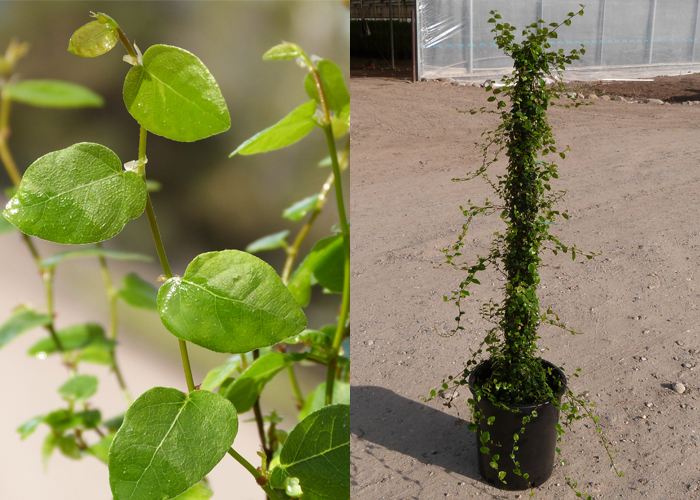 In young stages, gives very little indication of its potential vigor, the delicate tracery of tiny heart-shaped leaves frequently seen patterned against a chimney or stucco wall is almost certain to be F.plumilam but in this growth phase gives no hint of its powerful character at maturity. There is almost no limit to the size of this vine and area it will cover. Neat little leaves of juvenile growth ultimately develop into large leathery oblong leaves borne on stubby branches which bear large oblong fruits. The stems in time envelop a 3 or 4 story building so completely that it becomes necessary to keep trimming away from windows. It is safe to use this fig on a house if the vine is cut to the ground every few years or control by removing the fruiting stems from time to time as they form, roots are invasive, probably more so than most other figs. Because it is grown on walls, and thus protected it is found in colder climates than any other evergreen fig. Will not climb on hot south or west wall, or will be an unattractive yellow, sometimes slow to begin climbing. cut back to ground soon after planting to make new growth that will take of fast.